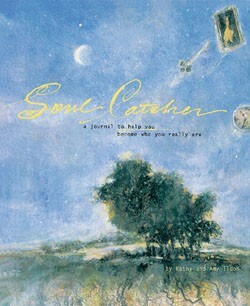 Not long after my dad died, my grandmother gave me a book called ‘Soul Catcher’. A ‘Soul Catcher’ is like a dream catcher, but for the soul. It’s a journal full of inspiring pictures and prompts designed to help you find yourself and escape depression. While I never really used the ‘Soul Catcher’ for its original purpose, I can’t forget that book. What I can’t forget about the book is the story of the woman who wrote it. She talks about how she reached her professional goals and wrote prolifically for the public on a number of subjects, but that her own writing, her journalling, grew more tortured even as she gained more success. She reached the darkest part of her depression one day when she uprooted herself, moved to a small apartment in a new country, and went on a journey–through journals and crude art therapy–to find herself. As a pre-teen suffering from severe depression, I latched on to that story. I still struggle with depression every day, and during my struggles, I often think of the ‘Soul Catcher’ and the story it contains. Over the years I’ve come up with a number of ways to help alleviate the depression I suffer from. Some of them are fairly common methods, others are more unique to me. Today I’d like to share some with you, in the hopes that it will help you in your own dark times. 1. Don’t forget to write for yourself. We’ve all written things for other people. Whether they be home made greeting cards for our friends, love notes for our dates, reports for our bosses, or stories written as gifts for the people we love, they’re there. And while this is writing, and does count towards the goal of writing every day, it’s not writing for yourself. As I’ve started to earn money as a writer and to work for the Penumbra blog, I’ve learned a lesson about this. We must not forget the projects we love. Writing ten blog posts for some company trying to market themselves might pay the bills, but it won’t soothe your soul. Don’t completely abandon your life-long novel project for paid work. Visit it every day, even if all you do is write a sentence. This includes journalling too. It’s okay to journal every day. It’s also okay to journal sporadically. Whatever your preference, don’t forget about it. Your journal is your best friend when you’re suffering from depression, because no matter what you say, it won’t judge you. 2. Remember to go outside. As writers, our passion–and for some lucky folks, their job–involves a lot of sitting alone with a notebook or a computer. You might be an introvert, but isolating yourself from the outside world usually doesn’t make you happier. Note that I’m not saying that you need to talk to people. What I’m saying is go outside. Go for a walk. Find a nice tree in a park to sit underneath and listen to the birds. You’ll soak up some vitamin D, which I’m told makes us happier, and you’ll get some exercise, which I’m also told makes us happier. The sounds of the birds always help cheer me up, and the change of scenery might just inspire you too. 3. Make time for the things you love. I talk a lot about how to make time for your writing, but I’m sure writing isn’t the only thing you love. We can’t just spend all our time working and writing. For one thing, we need time to read. And we all have other hobbies. I like to dance, and even if it’s only once a month or even every two months, I make sure I get to go out dancing. Some of us play video games. Some writers like to knit or sew. Others like to cook. Still others like to garden. Make sure that you have time for these things you love. Depriving yourself of the things you love is the quickest path to depression. So don’t start. Tonight, take time to do one thing you love–I guarantee you’ll feel better for it. 4. Don’t over commit. There are only 24 hours in a day. We all get THE SAME AMOUNT OF TIME. We all work at different paces, so we can get different amounts of stuff done in that twenty-four hours, but there’s only so much even the fastest of us can do. I’m really bad for this, especially with writing projects. I go, hey, I have a really high WPM, I can write a novel in three days, I can write this article and this one and three blog posts for next week and start my next edit of my novel all in one day. Then I discover I can’t, and I get mopey because I didn’t do everything I wanted to do on a specific day. This is what we call setting ourselves up for failure. I do this all the time, and I know it’s one of my main sources of depression, but I’m always working on it and trying to really assess what I can accomplish in a day. Don’t set yourself up for failure: figure out what you can realistically accomplish in a day without burning yourself out, and limit yourself to that amount of work. 5. Reward yourself for small accomplishments. One of the main reasons why I think most people get depressed is because they don’t realize how major what they’ve accomplished is. Even small accomplishments deserve recognition. Some days accomplishments mean more than others. So, if you’re struggling to write a single word and you get a whole page down, reward yourself. They tell me the sugary treats lead to more guilt later, so reward yourself with a cool drink and some relaxation time. If you managed to diffuse a tense situation, give yourself a pat on the back. If all you did today was get to work on time, work until the set time, and leave when you were supposed to, that’s still something worth rewarding yourself. You should always reward your small accomplishments and remember to be proud of them, too, not just the big things like getting your masters degree, but the small things like each individual essay you wrote to get that masters. Remembering these things when your depressed can help remind you that you are an awesome person, full of talent and with many gifts to give to the world. Most importantly, remember that these tips aren’t just for when you’re feeling down. If you take the time to treat yourself nicely and to enjoy the things you love even when your life is great and you’re happy, it will be easier to remember these things when you’re depressed–and it might even stop you from getting depressed in the first place.